At this step, define the boundary conditions for the conceptual model. •Structural Zones have been created. •Property Zones have been created. •You have imported and/or created the data objects you want to use for defining boundary conditions. For example, polylines for the geometry or Surfaces or time schedule for defining the attributes. Every conceptual model requires an appropriate set of boundary conditions to represent the system’s relationship with the surrounding systems. In the case of groundwater flow model, boundary conditions will describe the exchange of flow between the model and the external system. 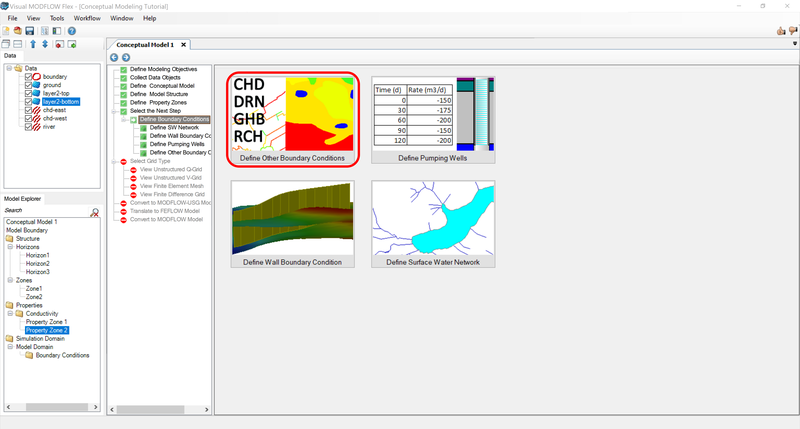 The workflow for defining a pumping well boundary conditions and a Wall (Horizontal Flow Barrier) is different than that of defining other boundary conditions such as recharge, specified head, river, etc. Please see the following section for information on defining pumping well boundary conditions. For information on how to define all other types of boundary conditions, please skip to "Defining Other Boundary Conditions" section. From the Model Explorer tree, right-click on the desired boundary condition, and select Edit Boundary Condition... from the pop-up menu. Once modifications have been made to the input parameters, click the [Finish] button to save the changes. •From the Model Explorer tree, right-click on the desired boundary condition and select Delete from the pop-up menu. •You will prompted with a confirmation message. Click the [Yes] button to delete the boundary condition. If you need to include contaminant transport in your model, then the species concentrations for transport sinks/sources must also be defined while you create your conceptual boundary conditions. By default, species concentrations will be undefined when you create a new boundary condition. An undefined value is identified by the value "-1" for the species concentration (eg. Conc001, Conc002). If you with to assign a contaminant mass to a specific boundary condition object, then replace the default -1 value with a representative contaminant concentration. In Visual MODFLOW Flex you can create boundary conditions in the conceptual model and in the numerical model. When you edit a conceptual boundary condition object, its corresponding numerical representation will not get updated; likewise, when you update a numerical boundary condition, its corresponding conceptual representation will not get updated. The one exception to this rule is Pumping Wells.